The Google IO keynote was full of predictable "surprises" like the Google Home smart speaker, plans for the DayDream VR headset platform and the Android Wear 2.0 update. I was really hoping to see the Google self-driving car teased, too. The steering-wheel-free and cute-looking autonomous car is several years out, but is fit for a Google IO tease one year. This is the car that could help save the 1.25 million people who die every year in traffic accidents. Why not now? I thought, given the venue switch from a busy San Francisco convention center to the company's more scenic outdoor amphitheatre, it all made sense for 2016. Perfect, right? Sadly, for all 7,000 people in attendance at Google's headquarters and the millions more streaming the keynote live on YouTube, the car never made its grand entrance. I drove away (in a vehicle with a steering wheel and gas) a little unfulfilled. Not with Google IO, per se, but with my heightened expectations (I had the same expectations last year). The Google self-driving car's artificial intelligence (AI) must have detected my anguish. After all, it's filled with cameras, radar and LIDAR sensors. Surely it can pick up on our emotional state by now. It may have been the first time in our lives that we purposely stopped at a yellow light. Out of the right lane, our Editor-in-Chief and driver extraordinaire Darren Murph spotted the self-driving cars in the right lane. It was slowly making its way through Mountain View traffic. We were in the left lane without traffic, passing Google's car and approaching an intersection. It may have been the first time in our lives that we purposely stopped at a yellow light. And there it was: Google's self-driving car. What do you do when you see the car of your future for the first time? It's not just any car. This is the car that could help save the 1.25 million people who die every year in traffic accidents. Between 20 and 50 million more people suffer non-fatal injuries, with many incurring a disability as a result of their injury, according to the World Health Organization. That's why this will be my next next car - whenever it's ready (and goes over 25 miles per hour). Naturally, I snapped a dozen photos of it in the wild with my DSLR, luckily in hand. Living in Los Angeles, I buy into the theory that autonomous vehicles will one day cut down on traffic. I even had the gall to open my passenger car door to get a better angle of the Google self-driving car. I had about 30 seconds before the red light changed. It didn't hit me and stayed clear of the cyclists directly in front of the car with ample buffer room. The bikers joked that they were all part of the self-driving car's research team. 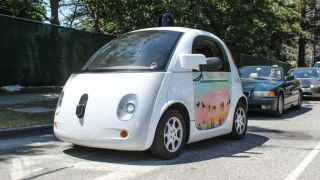 When the street light turned green, Google's self-driving car took a right, but not before waiting for pedestrians to cross in a crosswalk. Then it steered itself out of my life - for now. There's clearly a lot more work to be done. A lot more. However, living in Los Angeles, I buy into the theory that autonomous vehicles will one day cut down on traffic. I'm happy to say I got my first glimpse of that vision at Google IO. I asked some Google reps if I could take it for a test ride and write this as "I just rode in the Google self-driving car, the vehicle that will save your life," instead of "I just saw it." I got a polite "No." Maybe next year? It's never too early to set my expectations.